“Much inconvenience having been felt by the Public here from the great scarcity of specie. The States met yesterday and passed the enclosed Act, by which Your Lordship will perceive that this assembly is desirous of issuing a local coin provided such a measure should meet with the approbation of His Majesty's Government. I have to report to your Lordship that every effort to keep a sufficiency of circulating specie in this island has proved ineffectual and I therefore take the liberty of recommending that the measure now proposed may be sanctioned. “I heartily wish that you could get your States to authorize the coinage of Ten Thousand Pounds in Guernsey tokens. This with the coinage ordered by the Jersey States would set all disputes and differences respecting money matters at rest for ever. “The coin current in Jersey was, until lately, chiefly that of France, with a small proportion of Spanish money. The usual amount of specie, in circulation, has been estimated at nearly £80,000 sterling. After the French revolution, the coin of England became more generally into use, until the increased value of gold and silver completely drained the island of all specie but copper, and even that became scarce. There were, at this period, three regular banking houses in the town of St. Helier. These, and a few mercantile men, were accustomed to issue notes, payable to the bearer on demand, for twenty-four livres French currency. 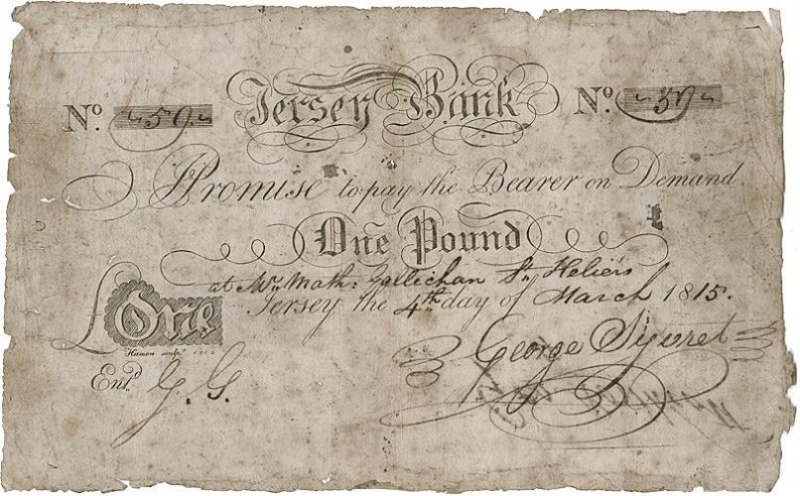 So great, however, and so increasing were the inconveniences occasioned by the almost total disappearance of silver, that those houses were obliged to issue notes of five and ten shillings: these induced individuals to do the same; all having “Jersey Bank” on their notes; until there were about eighty of these soi disant bankers. 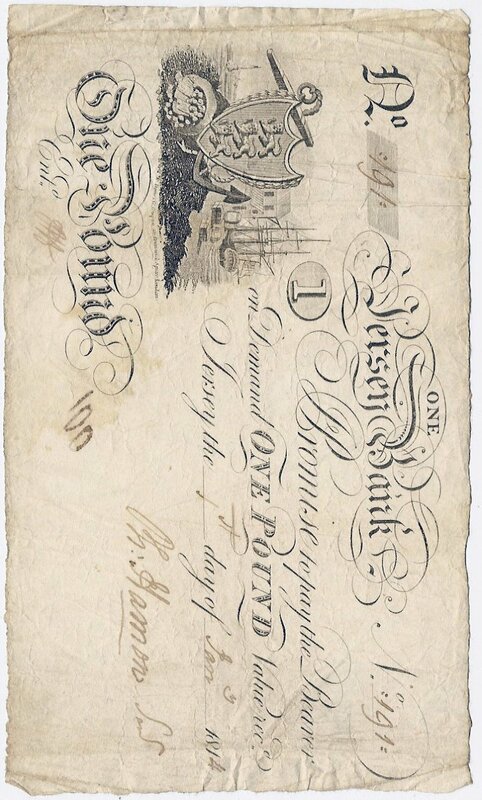 The island was soon inundated with notes, from the value of one pound down to that of one shilling; many of them issued by the lowest description of traders and publicans. Alarming as this undoubtedly was, necessity gave to these notes a general and ready circulation. Seriously aware of the ultimate consequences, likely to result from this unrestrained emission of paper money, the States resolved to have a silver coin struck: accordingly a quantity of tokens was issued, bearing the value of three shillings, and of eighteen pence English, to the amount of £10,000 sterling. * The issuing of notes under the value of one pound sterling, was then forbidden; yet such apprehensions respecting the notes still in circulation were excited among the country inhabitants, that those who attended the market, hoarded all the coin and tokens they could procure: this was at least the reason assigned and generally believed, for the disappearance, in a few months, of nearly all the newly coined silver. The scarcity still continues, though not in the same degree. * About the value of £2600 sterling has been added. The States have since made an act, whereby every person issuing notes payable to bearer, is to have a regular office for the payment of them in the town of St. Helier. In consequence of this regulation, many have withdrawn their notes from circulation. The rapidly increasing evil is thus checked, but the public security will probably render stricter measures necessary”. It is of interest to make a comment about the mintage figures quoted in some leading books and journals. 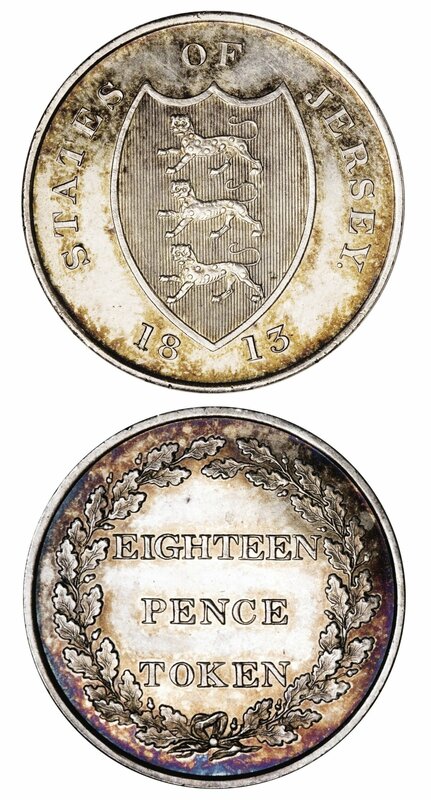 Most sources state that the mintage for the eighteen pence token is 90,800 and the mintage for the three shillings token is 45,400. These numbers can be traced to a guess by Pridmore. He first computed the nominal value of these tokens from the January 28, 1834, Jersey Orders of Council and then took a ratio of two eighteen pence tokens to every one three shillings token.8 Pridmore also quoted the January 28, 1834, Jersey Orders of Council, stating that the amount of tokens outstanding and not redeemed by the Committee as £1,363/7/6. This number is incorrect if one can assume that the amount redeemed is correctly stated in the Orders of Council as £12,256/12/6. Also note that this redeemed amount is mathematically incorrect. If we assume the redeemed amount is £12,256/11/6, then the computed amount remaining should then be £1314/9. As James O'Donald Mays states, “Their circulation over a 21-year period meant that few Jersey silver tokens survived in a mint condition. Although far more than three shillings tokens were struck, they are rarer today than the 18 penny pieces. A possible explanation is that when the tokens were recalled, holders were more anxious to have their large denominations redeemed than the less valuable 18 penny piece.”9 One can only guess at the remaining numbers of these most elusive pieces left for the collector. To learn more about this subject, please read the Royal Mint documents concerning this issue. Both silver tokens are scarce and are extremely rare in an uncirculated state. Currently I have ten of the 18 pence tokens and twelve of the three shillings tokens, with two three shillings tokens in uncirculated condition, and one 18 pence token in proof, another in an uncirculated state, and finally one in almost uncirculated state. Pridmore incorrectly estimated the mintage as 90,800.6 From Royal Mint documents the number of coins minted is either 38,739 by value or 38,740 by weight. Pridmore incorrectly estimated the mintage as 45,400.6 By using the Royal Mint documents to compute the mintage, the numbers are by value to be 71,104 and by weight as 71,115. Thus, we have almost twice as many of the larger tokens minted as that of the smaller piece. These tokens were minted in 1813 and 1814. Most tokens were weakly struck in the center. A few proof examples were struck in copper. The British Royal Mint, which opened at the Tower Hill location in 1811, struck Jersey silver tokens in 1813 and 1814. Guernsey has the English spelling, not the French. All of the penny tokens have a diameter of 34 mm. The diameter of the half penny token is 29 mm. You can read in The Bazaar, the Exchange and Mart a nice description of these Jersey tokens. To learn more about 19th century British copper tokens in general, you need to the read the best book on the subject, British Copper Tokens 1811-1820, by Paul and Bente Withers. This book is fully illustrated and was written to set the standard. No numismatic library is complete without this book. “Of particular note is the collection formed by Francis S Cokayne who assembled an astounding number of tokens, probably the finest, and most extensive collection ever formed. He began collecting, along with his brother, Morton, in the late 1880s, had the pick of James Atkins’ cabinet, traded regularly with many of the noted collectors of the period, and seems to have participated in every public token auction in the United Kingdom for over 50 years, either directly or through a representative (it was a standing rule at Baldwin’s that staff could not leave on Friday until a new parcel of tokens was posted to Mr Cokayne’s offices on Montagu Square). A number of the tokens in this auction can be further traced through him to William Norman, Frederick Lincoln, Samuel Hamer, Lionel Fletcher, William Davis, and, of course, James Atkins, among others." It is interesting to note that a similar piece was purchased by Mr Cokayne at the ex Murdoch auction of 12/12/1904, LOT 209 for 5 pounds 15 shillings, which makes this one of the most expensive tokens he purchased. Tokens 7,8, and 9, the Jersey Bank Tokens, share the same reverse die. For the first token, the obverse has the Badge of the Prince of Wales, three ostrich feathers enfiled in base by a coronet, and on a ribbon the motto: ICH DIEN. The legend is “TO FACILITATE TRADE” and the date 1813 is beneath the badge. 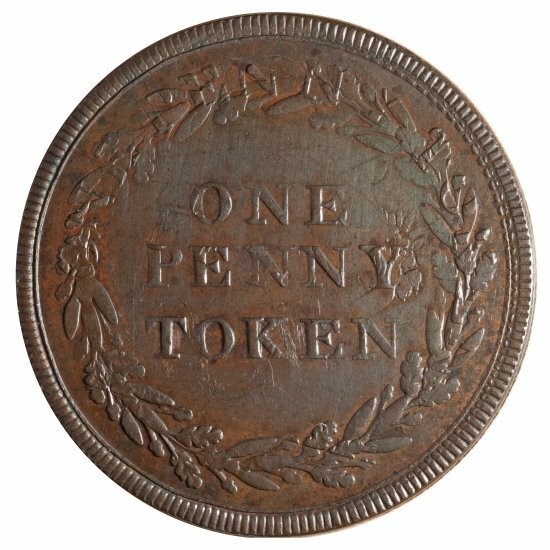 The slogan “TO FACILITATE TRADE” was used to encourage circulation.12 The reverse is simply the inscription “ONE PENNY TOKEN” in three lines with the legend “JERSEY GUERNSEY AND ALDERNEY.” The diesinker was Thomas Halliday, the most famous diesinker of the early nineteenth century British copper tokens. There are several different minor varieties depending on the graining of the edge and die orientation. This particular variety had a rusted reverse die. This token is the easiest token in the series to locate but is still considered rare. Regardless of the edge type there are probably not more than a dozen currently available to a collector, which probably means two dozen extant.11 Both the obverse and reverse dies are muled with other dies of this period and form the basis of the series. This particular example of this very rare token is from the McCammon collection. 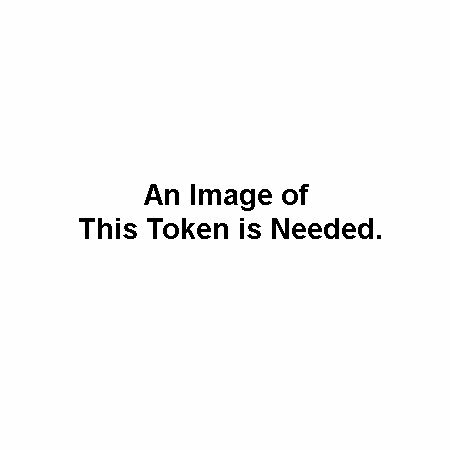 There are probably less than four of these tokens available to collectors. The third token is also a very rare token. The reverse is similar to the last two. 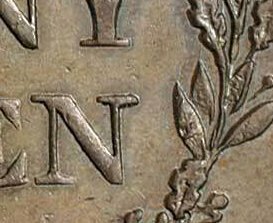 The obverse has the inscription “ONE PENNY TOKEN” in three lines inside an oak wreath. Various sources do not seem to agree as the engraver of the dies. Since there is a small H on the leaf opposite of the N in TOKEN, it would appear that the engraver is Halliday. Unfortunately, it is ofen difficult to see this tiny H. Also note that the spelling of Guernsey is the English version as opposed to the French Guernesey. The French spelling, Guernesey, was found on their coins from 1830 through 1949. The fourth token is also rare and it might not have any direct connection with the States of Jersey. The obverse is the druid design. The reverse has a female (Commerce) seated on a bale of merchandise holding an olive branch in her right hand and a cornucopia in her left. In the distance, a ship can be seen. There are various examples known to have been struck over the McCammon T6 token, which was definitely used in Jersey. The fifth token is a rare mule token, which could have circulated in Jersey. Like most of the other Jersey copper tokens of this period, they were engraved by Thomas Halliday, a die engraver and token manufacturer of Newhall Street and Hagley Row, Birmingham, England.14 The obverse is the Prince of Wales plumes design. This seems to be a favorite design of his, given the fact that he used it on several English tokens of this same period. The reverse is the same as the previous token. Thomas Halliday also worked for the Messrs. Morgan & Company, Die Makers, Medallists and Token Manufacturers. 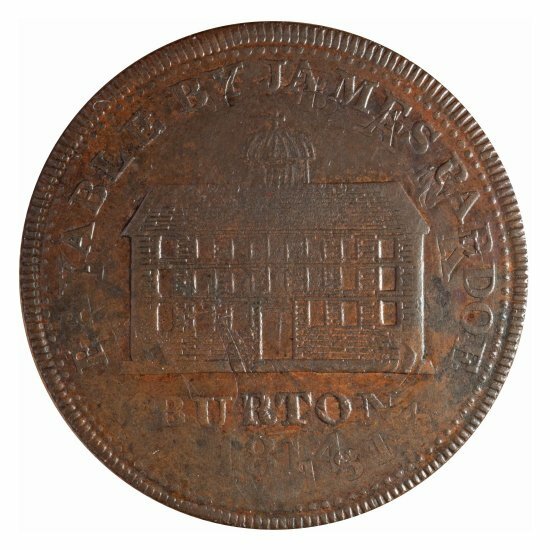 Mr. Henry Morgan advertised in the newspapers of the day and it is quite likely these copper tokens were ordered through and supplied by the Morgan firm, but possibly were “handled” by Thomas Halliday. You can read more about Mr. Morgan entrepreneurship in James O'Donald Mays' book, Tokens of Those Trying Times. For token number six, the obverse has a profile of George III laureated. 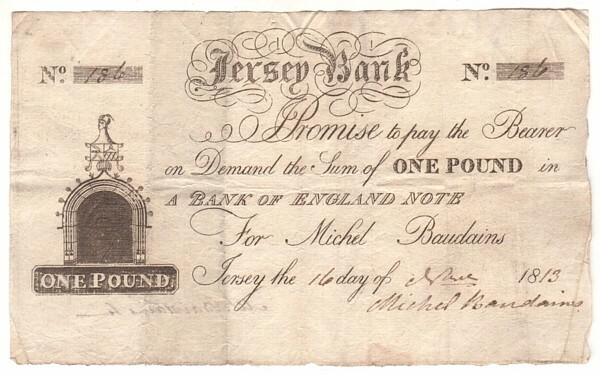 The legend reads as “JERSEY BANK TOKEN 1812.” The reverse has in the center “ELIAS NEEL JERSEY.” The legend is “A BANK OF ENGLAND NOTE FOR 240 TOKENS.” Elias Neel, a banker in St. Helier, issued this token. The die sinker of the token was Halliday while the manufacturer was Thomason.15 Unfortunately, this token has not been seen since 1834. This and the next three tokens are considered to be part of the Jersey bank token sub-series. They are all extremely rare and are hardly ever seen outside of captivity. For token number seven, the obverse has a draped and laureated bust to the right of George III, with an H on the truncation. The legend is simply “JERSEY BANK 1813.” Halliday engraved this die. On the reverse, there is a robed female figure seated to the left on a bale, holding scales and a cornucopia. Typical of these coins, the female represents Justice and Plenty. 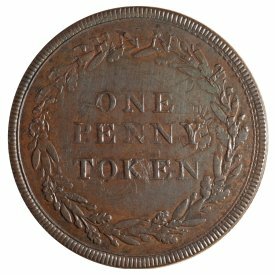 The legend is “ONE PENNY TOKEN.” There is only one known specimen available to collectors. For token number eight, the obverse has a draped and laureated bust to the right of George III, with no H on truncation. There are seven leaves in the wreath. The legend is “JERSEY BANK 1813.” Halliday also engraved this die. The reverse is the same as token number seven. The obverse of the ninth token also has a draped and laureated bust of George III to the right, with no H on truncation. There are nine leaves in the wreath. The legend reads “JERSEY BANK 1813.” This die was also engraved by Halliday. The reverse is also the same as token number seven. 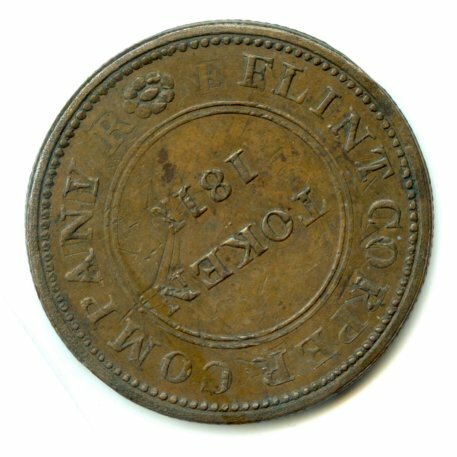 Here we have a Flint Copper Company penny token (W232) overstruck on a Jersey Bank penny token (W2039). 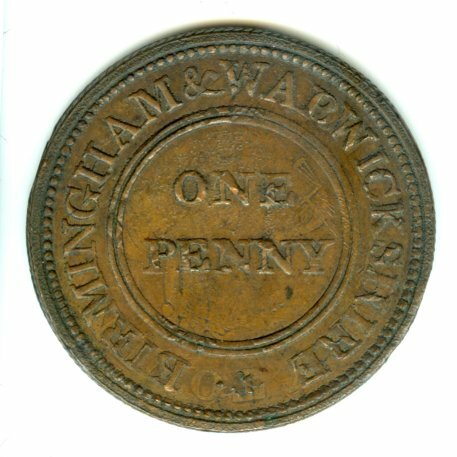 Here we have a Burton penny token (W641) overstruck on a Jersey Bank penny token (W2039). The obverse of the tenth token has a laureated and draped bust to the right of George III, within a wreath of oak. The reverse is similar to the Jersey, Guernsey and Alderney tokens. Once again, the die was engraved by Halliday. The eleventh token has the druid's head obverse. The reverse has a robed female figure, Britannia, seated to the left on a bale of merchandise, holding in her right hand a sprig of olive, and in her left a palm branch; a shield at the side. The legend is “COMMERCE” and in the exergue is the date 1814. Halliday engraved this die. The twelfth token has a robed female figure seated to the left on a bale of merchandise, holding an olive branch in her right hand and a cornucopia in her left hand with a ship in the distance. The legend reads “COMMERCE.” Halliday engraved this die. The obverse is similar to the first token with the Prince of Wales' feathers emerging from a coronet. The motto on the ribbon is “ICH DIEN” and under the crest is the date 1813. The legend is “TO FACILITATE TRADE.” Once again, the die was engraved by Halliday. The last token, number 13, for the obverse has a female, Justice, standing holding an olive branch and scales within a wreath of olive and palm branches. In very small print the words “SHEFFIELD PENNY TOKEN” is beneath the female. 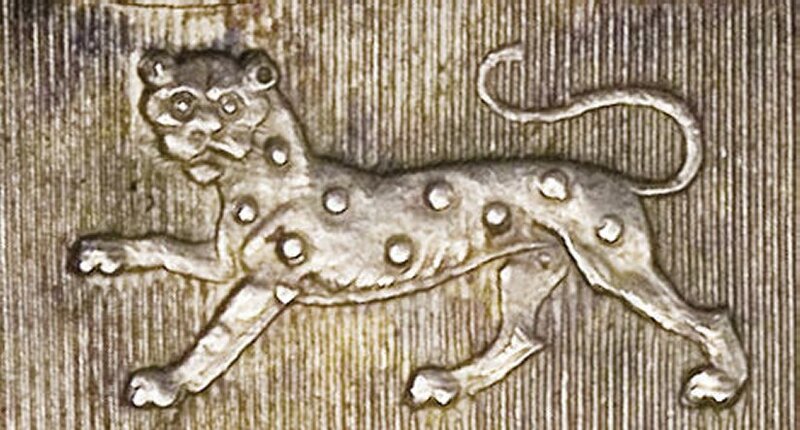 The other side is similar to the first token with the Prince of Wales' design. 1. Richard Sainthill, Olla Podrida; or Scraps, Numismatic, Antiquarian, and Literary (London, 1844), p. 27. 2. 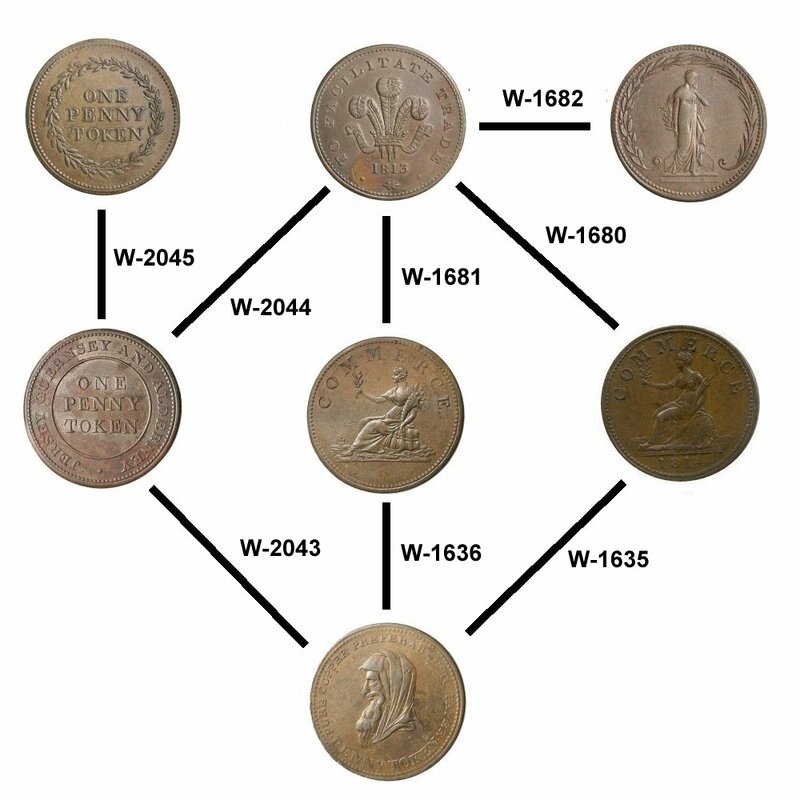 Societe Jersiaise Numismatic Section, Royal Mint Documents 1812-1814. Occasional Papers No. 4. 3. Lieutenant Colonel W. Marshall-Fraser, "The Coinages of the Channel Islands," Societe Guernesiasie, Report and Transactions, 1948, p. 321. 4. Jersey Heritage Trust L/F/95 General Don Collection L/F/95/B/21 Letter from Lieutenant General George Don, Government House to Viscount Sidmouth concerning the States of Jersey's desire to issue a local coin stamped with the arms of the Island, includes a copy of the act of the States 1812. 5. Jersey Heritage Trust L/F/95 General Don Collection L/F/95/B/29 Letter from Lieutenant General George Don, Government House to 'My dear Sir' concerning a memorandum relating to Jersey Revenues about the import on spirits; also concerns the possibility of Guernsey producing coinage of £10,000 and the passing of an act in Jersey for additional coinage, and quarantine on all vessels arriving from the Mediterranean in 1813. 6. Lieutenant Colonel W. Marshall-Fraser, "The Coinages of the Channel Islands," Societe Guernesiasie, Report and Transactions, 1948, p. 309. 7. Lieutenant Colonel B. Lowsley, The Coinages of the Channel Islands (London: Victoria Printing Works, 1897), p. 36. 8. Fred Pridmore, The Coins of The British Commonwealth of Nations, Part 1: European Territories (London: Robert Stockwell Ltd., 1960), p. 45. 9. James O'Donald Mays, Tokens of Those Trying Times, A Social History of Britain's 19th Century Silver Tokens. (Hampshire, 1991) p. 160. 10. Sir Joseph Banks - Papers, 1767-1882. Papers concerning coinage and the Royal Mint, 1787-1813. State Library of New South Wales (see Series 84.21 frames CY 3684 / 220 and CY 3684 / 221). 11. Private correspondence between H. K. Fears and Paul Withers. 12. A. L. T. McCammon, Currencies of the Anglo-Norman Isles (London: Spink & Son Ltd., 1984), p. 194. 13. Ken Elks, Coinage of Great Britain. Celtic to Decimalisation, Part 9, Provincial Token Coinage. http://www.predecimal.com/p9tokens.htm. 14. W. J. Davis, The Nineteenth Century Token Coinage of Great Britain, Ireland, the Channel Islands and The Isle of Man, to which are added Tokens of Over One Penny Value of Any Period (London: B.A. Seaby Ltd., First Edition 1904), pp. 241-242. 15. R. C. Bell, Copper Commercial Coins 1811-1819 (Newcastle, 1964), p. 157.